Discourse about organisations is littered with leadership theories, models and paradigms that focus – not unreasonably you might think – on the qualities, traits, skills and habits exhibited by individual leaders. Even the frontrunners of leadership thinking – Bennis and Kotter in particular – still talk about leadership as if the organisation in which the leader operates were largely peripheral. It's as if historians were still talking about the character of Robespierre and Danton and hadn't yet begun to notice the importance of hunger, rationalism, unemployment and housing in fomenting the French revolution. Until now, only Peter Senge has really confronted the systemic aspects of leadership, and he has moved on into the Elysian Fields of Presencing and Theory U. 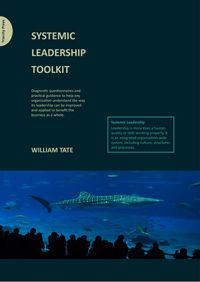 Finally, Bill Tate has written the defining book on organisational leadership. Called The Search for Leadership, it seeks to reintegrate the organisation into the debate, downplay the personality of the leader and reopen the discussion about what leadership actually means for any organisation in a networked economy. Order The Search for Leadership (hardback, paperback and e-book editions available). Richard Hackman and others have developed the theory of Functional Leadership, but this again focuses on the role of individual leaders and groups of leaders, although it stresses the different types of leadership behaviour that can emerge in different situations. It identifies the tools by which leaders can become more effective and extract improved performance from others. Contingency Theory suggests, again, that the "Great Man's" capacity to lead is constrained by a range of factors, but these mainly include the leader's preferred style and the ability of followers. Around 2002, Peter Senge became the first organisational theorist to talk at length about 'systemic leadership, but, as his interest in Presencingand the Fifth Discipline thinking developed, he rather left this notion behind. Now Bill Tate has revived the discussion with a masterly book about the theory and practice of Systemic Leadership. The Thinking Challenge offers the kind of detailed analysis of the problem that will be welcomed by researchers, lecturers and students in universities and business schools everywhere. The more practical Intervention Challenge tackles each aspect of leadership on a theme-by-theme basis and is an invaluable resource for anyone seeking to improve leadership in an organisation or studying the process by which leadership is engendered and disseminated without and across the organisation. It provides an in-depth focus on current leadership issues, from discussing the purpose of leading versus managing, through learning the language of Systems Thinking and developing a leadership culture, to exploring a range of processes by which leadership can be held to account. This eye-opening account of the leadership challenges organisations face will change forever the way you think about leadership and help improve the way any organisation is run.